Introducing the newest addition to our sweeping system. The Tennant 6600 Parking Lot Sweeper! Tennant parking lot sweepers have a patented cleaning technology to effectively clean even the largest parking lot area quickly with optimal dust control. Tennant Industrial rider parking lot sweeper features a wide cleaning path & large hopper to capture everything from cement dust to heavy debris. 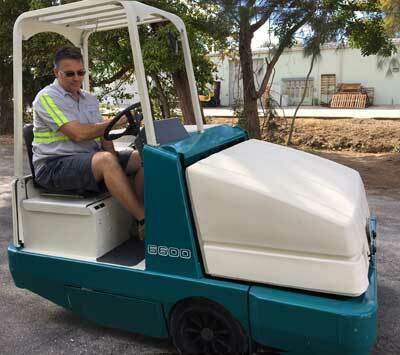 With its 3 wheel design it's perfect to maneuver in tight spaces such as parking garages and warehouses. Hire us for your industrial parking lot sweeping projects - for new construction, renovation, or storm cleanup. We own our own equipment and will make sure your property is swept to your satisfaction. Heavy duty equipment for the heaviest jobs! When completing your new construction project we’ll broom sweep the parking lot to prepare for striping, your final inspection, or any reason you require. If the contractor and landscaper left a mess for you, call us, we’ll take care of making sure you make a great first impression. 1st Impressions is the leading parking lot sweeper for Lee County, Florida., Serving Ft Myers, Cape Coral, Estero and Bonita, Florida.